I took that photo through my own kitchen window, this morning, the big horizontal lines being my Venetian blind. My kitchen is three stories up in the sky, and this guy was standing not on the ground but on scaffolding, bits of which you can see, and upon which workers now clamber about each morning, banging, scraping, hole-filling, painting, and so on, generally making everything look nicer and work better. This guy was not taking pictures for fun. 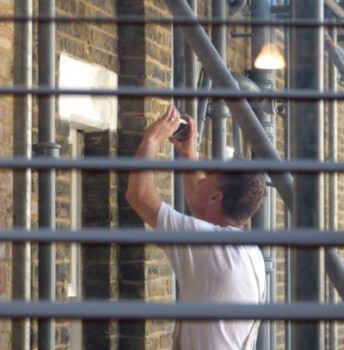 He was recording the progress of the job. Think about that. Think how much easier it now is, in the age of cheap digital photography, to keep track of a job like this one. Think how much easier it is for the workers to know exactly what they did, exactly when. Any disputes about whether the various stages of the job were done, when they were supposed to be done, to the required standard? Did some damage get done, and is there a dispute about when it happened, and hence who was responsible for it? Here are the pictures. Human memory plays tricks, but cameras have memories built into them, recording not just the picture, but the date and the time of the picture. All the photographers involved need swear to is that they didn’t tamper with the timing system. A basic part of doing work is recording the work you have done, and recording the fact that the work was up to standard. This is especially true if the work done will shortly be buried under further work, as is so often the case with building projects of course. Think what a contribution to this recording process the digital camera has, for quite a few years now, been making. I have to report the distressing news that Princess Shirley is dead. Princess Shirley was the wife of Prince Leonard of the Principality of Hutt River. He seceded from the rest of the State of Western Australia in 1970, and his principality is still going strong. A connection to this post is that he regularly updates the webpage of the Principality. You can catch up on a real libertarian outpost by googling Hutt River. One of the things that might actually get me to replace my 2005 Sagem MY-X2 (it ain’t broke, OK?) is that in the event of a scrape or collision it would be useful to have a camera phone, as I believe are quite popular among the populace now, to record damage done as evidence against potential disputes. The pending film Fruitvale [Station] is another instance. Well, yes, but you happened to catch the guy on the job, so to say, but he could just as easily have been taking pics through your own window while you were out the room. Don’t overlook the usefulness of photographs of taking a thing apart, for putting it back together. When you’re in a strange city, as you leave the train station or parking garage, take a picture of the corner street sign. Then, every time you turn a corner, take a picture of the next street name, and so on. Then when, as inevitably happens to me, you get lost, just follow the breadcrumb photos back to the train station or your car. When you get home you can give everyone a tour of the city. As usual, Randall Munroe has something to contribute. 25 years ago a roofing contractor climbed up on my parent’s home and shot some pictures of the shingles and chimney with a Poloroid camera. He used these to illustrate the repairs he proposed to make, without their having to cling to the rain gutter. After the work he took new shots to show how sturdy everything looked. Some ideas are so good they work in many technologies. That’s mostly what I use mine for. Just rebuilt a carburetor and taking pictures saves a ton of time. Also good for taking a look into a confined space. I’ve used it to see exactly how an alternator was bolted to an engine block. In another case I used it to read off the info off a router that was stuck onto the upper shelf of a small closet. Beats having to unwire the whole thing. One other use, at least prospectively: I have a vintage preamp that expired with a loud pop! through the speakers and a smell of burning. It looks OK, so I’m planning on using a PC camera that’s supposed to see into the infrared to find the overheating bit. We shall see. My younger employees never copy anything. They simply take a picture of it. I’d lay odds that the broken bit won’t be getting hot any more. But you’ll likely find a capacitor has died, just look for deformation of the metalic can, burn or scorch marks. Digital photography saved me from an incompetent council. I appealed a parking fine but a ‘principal officer’ from the council wrote back rejecting my appeal and telling me to pay up. He warned me not to be ‘vexatious’ about the matter or I could be fined up to £5000 more. Enclosed with my rejection letter were three photos taken by the warden clearly showing my car legally parked. When told of their bungling the council wrote back telling me my fine had been ‘waived’. No apology of course. We used to live on a corner. We got pinged a few times by Council parking inspectors for parking our car too close to the corner. Council refused to put up a “No parking” sign indicating where it was legal and illegal to park on that corner – it was a very lucrative spot, with the inspectors ticketing people daily. They relented when I sent them a photo of a councillor’s car parked illegally in that spot. Like everyone else, they weren’t aware they were parked there illegally. A workman was out front the next morning with a sign, a shovel and a bag of concrete. I find digital photography enormously useful in charting and recording the services in my house, DIY, before and after, boundaries, in case of future disputes etc. Film cameras with their bulk, and the constant need to think carefully about taking a picture because of the cost of film, the time spent in waiting for results and so on, did not lend themselves to this. I’m installing a spur on to a ring circuit, and beneath my floorboards there is a veritable jungle of cables, which digital photos are enabing me to sort out. They are also useful for showing customers inaccessible features if you are a tradesmen. When I got a quote for work on a diliapidated chimney top, the builder was able to take a picture and show me immediately why it needed sorting. One way the digital camera is used in the most annoying way is by the local government. In the town I live in in the US, after making permitted changes to my property, the city comes in and takes pictures before giving final approval. These are often pictures of the interior. You are at their mercy at that stage and can’t tell them that you don’t want them taking photographs. I find it intrusive and unnecessary. The digital age has it’s negatives. Especially during music gigs when people are holding up mobile phones or even worse iPads. Enjoy and live in the experience and stop trying to document it with blurred images or shaky music videos that you’ll never likely look at.